WEST HARTFORD, CT- The UMBC Retrievers are a perennially tough foe for the Hartford Hawks and they continued that trend Friday night at Reich Family Pavilion sweeping U of H in 3 straight sets. The Hawks gained the momentum early by taking a quick lead in Set 1, but UMBC caught back up and built a strong lead of their own, eventually fending off a Hartford comeback to win 25-21. The two teams started set 2 trading points but an 8 to 0 run with the score tied put the set out of reach, and the Retrievers took it 25-13. The visitor’s appeared to be well on their way in set 3 with a good lead throughout, but the Hawks charged late tying the set at 25, and UMBC narrowly averted a fourth set with two quick points for the 27-25 set win. Hannah Schmidt, Sherelle Walker, and Krystal Mlemchukwu were the major offensive forces for UMBC. Schmidt had 16 kills, a .400 kill percentage, 4 aces, and participated in 3 blocks. Walker’s 9 kills (.391 kill percentage), added to Mlemchukwu’s 8 (.300), with 4 shared blocks made them all forces to be reckoned with throughout. Schmidt struck early and often with some of the most powerful spikes of the game, sending multiple off defenders and out of play, two of these came as the team came back from the set 1 deficit and joined with her two straight service aces helped the team regain a lead. Two more kills came during the decisive run of set 2 that built an insurmountable lead. In set 3 she had a sequence where she shared a block, whapped the ball off a Hawk out of bounds, and then had a solo block to follow that all in succession. 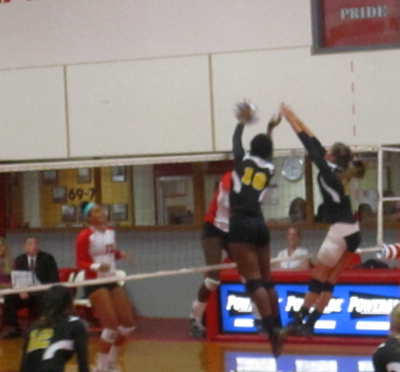 She also had the final point of the game as her spiked ball smashed into a defender and sailed into the far wall. In addition to the volume of Walker’s attacks, she had numerous hard attacks launched straight down the line, especially in set 1. In set 2 she placed her attacks of varying velocities into gaps in the U of H defense multiple times, as many of her kills after set 1 were using lighter attacks. Mlemchukwu also used great force with her kills unleashing many a smash throughout the game, including a precision kill across the court into a back corner. This in addition to the several blocks she took part in. Ali Loynachan added 5 kills, Katie Kelly, Mallory McIntyre, and Hallie Carter also were in on the scoring. McIntyre shared 4 blocks on the day and Kelly shared 3. McIntyre also picked up 40 assists as the primary setter which she used to advantage using fake sets to instead attack twice for points. Loynachan had most of her kills in the final set, sending on kill off a defender and into their bench. Carter put up two points in the final moments of the match including her blast that hit went off three players before hitting the floor to tie the game at 25-25 and keep the Hawks from getting a set win. Kelly also picked up her two kills in set 3 both times slamming the ball off the block attempt in front of her. Libero Ali Goc had 14 digs and she was all over the place making defensive saves to keep the play alive. Schmidt and Loynachan also picked up 10 or more digs each against the various Hartford attacks. Robin Lee participated in limited time with two straight service aces to open set 2 as both of her serves flummoxed the defense, one hitting the net, the other going unreturnable despite 3 hawks touching the ball. For the Hawks, Sareeta Nethersole had 11 kills, Lindsay Anderson 8, Dionna Kirton 6 and Kami Nethersole and Kathryn Gawrych each had 3. Jackie Tamburri, the setter, and Saara Carissimi the libero each had 2 service aces. Gawrych had 2 solo blocks and and was part of 3 others, she shared those with Sareeta Nethersole twice, and Tamburri once. Sareeta Nethersole had a least 6 kills in the first sent alone, with the last two being part of a comeback move by the hawks including when she slashed the ball through all the defenders diagonally to the corner floor. She also sent balls through, over, and off blocks. In set two, two of her crushing attacks alternated with Tamburri’s service aces, to give the team a lead. Also, during the last chance efforts in set 3, she and Gawrych had both of their tandem blocks, to keep pace with the Retreivers. Kami Nethersole, Anderson, Kirton and Gawrych all contributed in set 1, and Kirton and Anderson had their kills spread out through the three sets. Anderson had the distinction of crushing her attack over only to have it fly off the block, and into the UMBC bench causing the coach to dodge to let his players try to save it. Later another of her kills would have the force to rebound off a Retriever and slam into one of the posts holding up the net on the UMBC side. Gawrych really put up most numbers in set 3 including her two solo blocks. Tamburri had 31 assists and 9 digs during the evenings. Kirton led the team with 13 digs as Carissimi, Kami and Sareeta Nethersole all had a handful as well. With the win UMBC is 9 and 12, and 2-2 in the America East. Hartford drops to 6-13 and 0-3 in the America East, but gets a shot at Binghamton tomorrow in the hunt for their first conference win.